Welcome to Confessions of an Amateur Luthier! In the beginning there was certainly music . . . and it continues to be one of the most important, fundamental things in life, simply ‘elemental’, like food, but food for the soul. There comes a point in one’s life where you start to re-assess what you’re doing with your time and what your legacy will be when you’re gone. This started for me in 2004 for some odd reason. It probably had something to do with having turned 50! and I strive toward that ideal. I’ve always enjoyed doing thing with my hands, making things, fixing ‘stuff’. When I’m gone I’d like there to be more left than just having pushed bits around on computers all day. Don’t get me wrong, computers are important in my life, but there is more to it. So, I thought it would be cool to build a guitar, even tho’ I don’t really play it! So I started to build one . . . then I got interested in inlay, so I took an online inlay class. I did my first project, which was pretty cool fingerboard and head plate inlay (traditional vine pattern) for the guitar I was going to build. 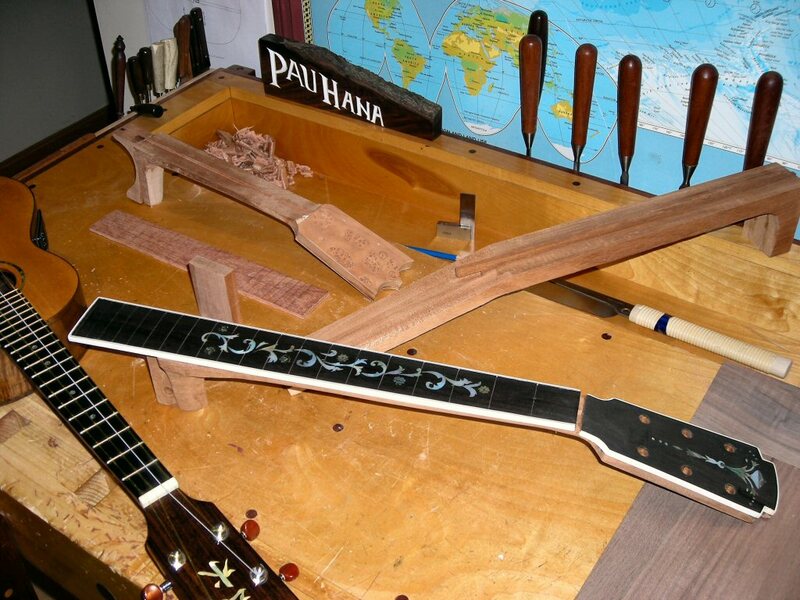 Then I immediately followed on with the advanced inlay class and created a more complex inlay of palm trees, an island and dolphins, so I built an ‘ukulele to put that inlay into . . . one thing led to another and along the way I’ve built about 15 ‘ukuleles and restored a few other instruments, a couple of balalaikas, a couple of Neapolitan mandolins, and even have a Sitar in the works. I’ve been actively building ‘ukuleles, but a few years ago I got it into my head to build a harpsichord, which is a much longer story. You’re welcome Rishi, and all readers. I enjoy sharing this kind of information and hope people are finding it useful.